The UCI Health Weight Management Program has helped thousands of people lose weight and keep it off by helping them practice the skills they need to succeed for life. We have a team of physicians, nurse practitioners, registered dietitians and behavioral health educators ready to help you achieve your goals. If none of the available sessions work for you, please call our office at 949-824-8770. We are dedicated to helping our patients lose weight and live healthier lives through dietary changes, exercise and health risk-factor reduction. We offer two weight-loss programs for our patients, as well as a maintenance program once your weight-loss goals have been reached. We work with you to determine which is best for you at an initial information meeting. This program is designed for individuals with a body mass index (BMI) of 30 or higher, or who need to lose more than 30 pounds. 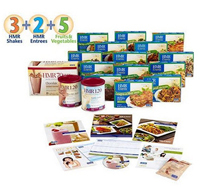 The weight loss diet is made completely of HMR shakes, entrees and meal replacement products. The average weight loss is 50 to 60 pounds, though patients who follow this program may lose 100 pounds or more. Participants receive a high level of support while they learn and practice new behaviors. This program is intended for people who have to lose 30 pounds or less, or individuals who want a more moderate weight-loss plan that doesn’t require medical supervision. The daily diet plan includes HMR shakes and entrees, as well as fruits and vegetables. Participants weigh in weekly and attend support classes, but generally, ongoing medical supervision is not required. The average weight loss in this program is 35 to 40 pounds, although many participants lose more. As in all our programs, long-term weight maintenance is emphasized. Since its inception in 1987, the UCI Health Weight Management Program has helped thousands of individuals lose weight and manage their health. We are dedicated to helping you lose weight and live healthier through dietary changes and reducing your risk factors for disease. Our team includes a cross-section of specialties, including physicians, nurse practitioners, health educators and registered dietitians. Our team specializes in working with patients who are experiencing medical complications of obesity, such as diabetes and hypertension. Instead of simply promoting weight loss, our program emphasizes better overall health through exercise, nutrition and positive lifestyle changes. We have two convenient locations to serve you: City Tower in Orange and Centerpointe in Irvine. The UCI Health Weight Management team includes physicians, nurse practitioners and registered dietitians who are here to help you achieve your goals. A healthy body mass index (BMI) is between 18.5 and 24.9. If you're unsure of your BMI, use the calculator below. If your BMI is above the healthy range and you'd like to lose weight, call 949-824-8775 to sign up for a free information session to learn more about the Weight Management Program.